After joining Cruise & Maritime Voyages in March 2015, the vessel entered service as Magellan after a refurbishment which included being re-liveried, and the addition of a new library, bridge and card room, and a modern aft deck relaxation area. 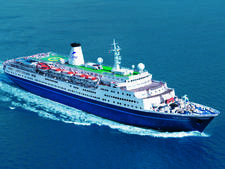 Magellan is the flagship of the Cruise & Maritime fleet and like sister ships Marco Polo and the Azores, operates as an adult-only ship. The cruise ship is named after the 16th-century explorer Ferdinand Magellan who masterminded the first circumnavigation of the globe. 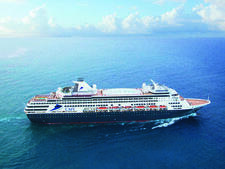 Certainly Magellan has some adventurous itineraries including a 120-night round-the-world cruise as well as 43-day voyages to the Amazon, West Indies and Azores. 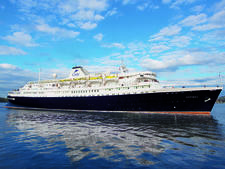 Closer to home, shorter itineraries include the Canary Islands, Iceland, Norwegian Fjords, the British Isles and the Baltic. Magellan's homeport is the London Cruise Terminal at Tilbury on the River Thames. The building -- a 1930s brick monolith with stained glass windows -- still uses its original wooden walkways for boarding, and if you can look up inside the structure, you can spot some lovely original frescoes. It was also, famously, the port where Windrush -- the ship which carried the first Jamaican immigrants post-World War II -- first docked. Magellan also sails from Newcastle upon Tyne and Dundee in Scotland. The ship's wide corridors and stairways, as well as expansive decks, give a feeling of spaciousness. Unlike some 'resort style' ships, Magellan exudes a feeling of intimacy and has several comfortable lounges with panoramic seating and observation areas -- ideal for the ship's scenic cruise programme. It's worth remembering this is a traditional-style cruise ship so don't expect to see bumper cars, climbing walls or FlowRiders .Bridge and deck quoits is about as energetic as it gets. Magellan's mandatory safety drill is more intensive than most ships inasmuch as after learning how to wear the life jacket and listening to the safety announcements, passengers are walked out in lines to their designated lifeboat. 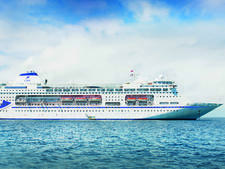 Magellan offers traditional British-style cruising and no-fly cruises from the UK. 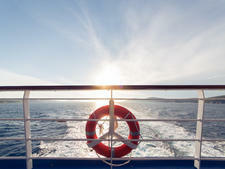 It is an ideal choice of cruise ship for couples of all ages, young adults and those on a budget. In general, Magellan passengers tend to be couples, age 45-plus. On a recent cruise to the Norwegian Fjords, 97 percent of passengers were British. Typically, other itineraries attract a minimum of 90 percent Brits with a small number of Australians and Americans. This is not a family ship -- the minimum age for sailing on Magellan is 16 -- and it is popular with couples, singles and groups of friends. Announcements -- the main purpose of which is to alert passengers to shore excursion departure times and updates -- are kept to a minimum and are all in English. The ship also suits those travelling alone, too, with regular singles events offered. These include a welcome cocktail party and coffee mornings and meetings, which are announced in the daily programme. Casual and comfortable during the day. More elegant clothing may be worn in the evenings and there are usually two formal nights on cruises of six nights or more. As a rule passengers adhere to the dress code though, as is often the case on cruise ships, a small minority ignore it completely. This isn't a spangles-and-sequins type of ship and on formal evenings, while there are a small number of ball gowns in evidence, women tend to opt for cocktail party outfits or smart trouser suits. On evenings designated 'informal' a suit or smart jacket and trousers worn with or without a tie is suggested for men while again, ladies can wear cocktail dresses or trouser suits. On nights where the dress code is 'casual' it is up to passengers what they wear -- though shorts, flip-flops and sleeveless tops are never welcome in the restaurants. 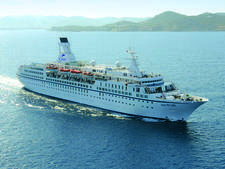 &pound;7 sterling per person per night (&pound;6 pppn on cruise of 16 nights and longer), which is distributed to your cabin steward and restaurant personnel, is debited to your shipboard account. The amount can be altered to reflect your level of satisfaction by contacting reception. There are no gratuities added to bar and spa bills. Currency onboard is in pounds sterling.